I've been whirlpooling for quite a while to concentrate hop matter in the centre of the Braumeister. 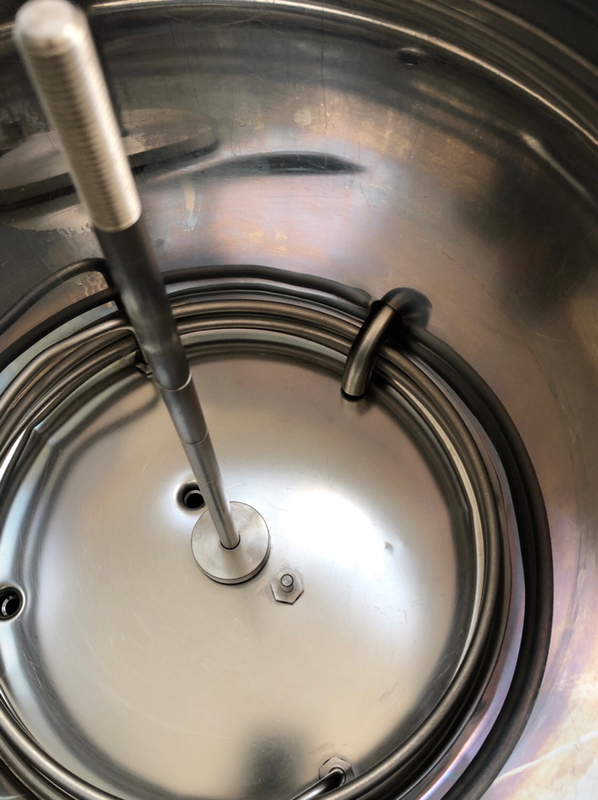 An issue with the braumeister is the amount of deadspace in the kettle below the outlet, requiring the brewer to tilt the unit in order to get a reasonable amount of the remaining wort out. 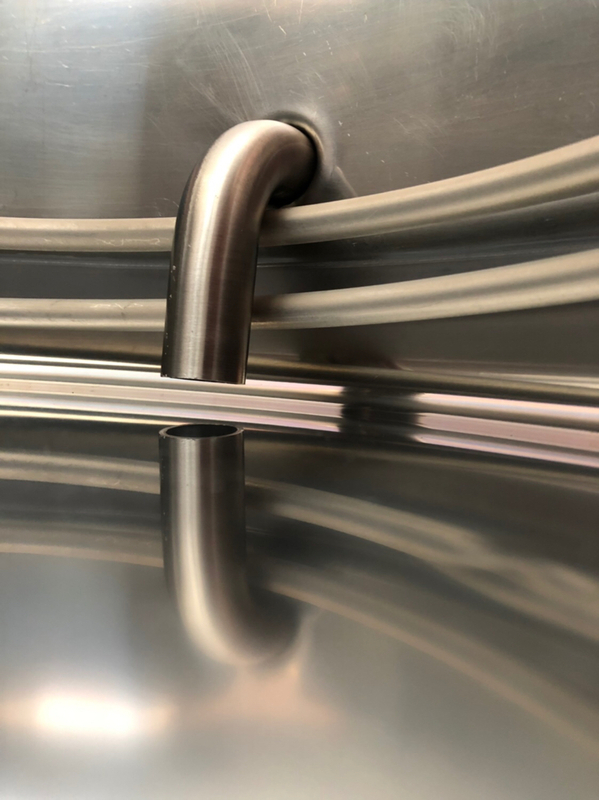 Even with a conventional whirlpool, tilting the unit gently to avoid the pump sucking air would result in a large amount of hop matter moving towards the outlet and sucked through. 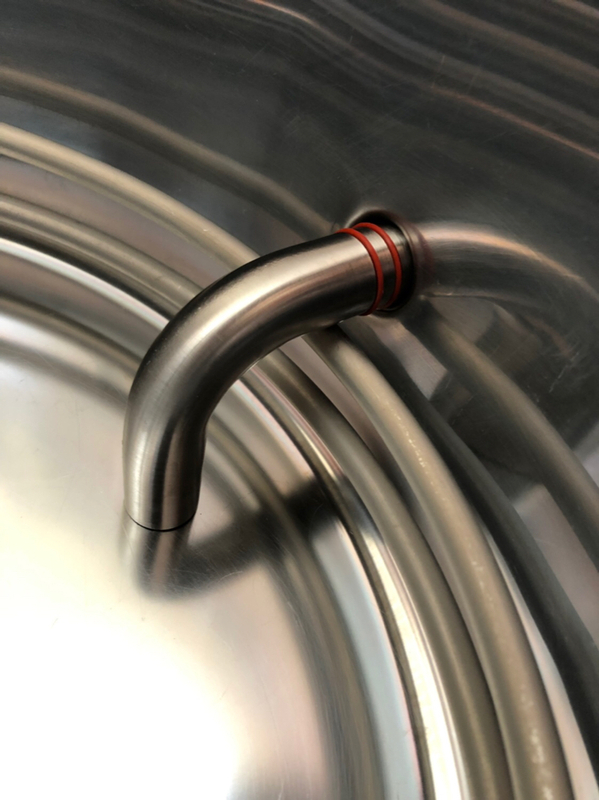 My previous planned solution was the intent to install a pickup tube in the Brau (PITA). 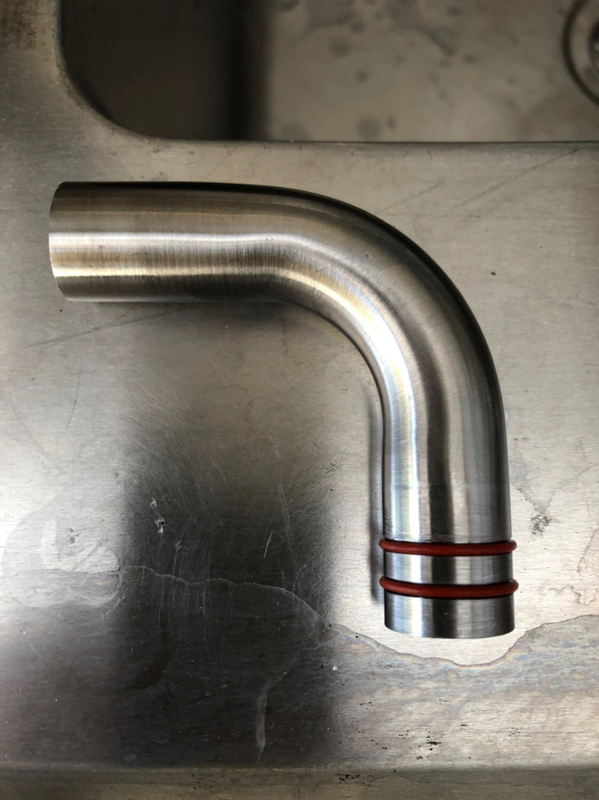 From other examples it's pretty much wedging a copper elbow in the outlet with the assistance of silicon tubing. 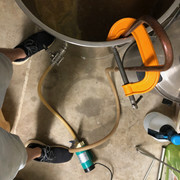 Last brew, I had the idea of inclining the vessel away from the outlet, while whirlpooling, to concentrate the hop material in the side of the vessel opposite the outlet. This worked even better than I expected. Pics below! That's a good idea Engi & one that could well work with other types of kettles, or fermenters for that matter. Do you use a hopsock or similar? I ask because that really limits the amount of hop residue settling in the kettle in the first place. 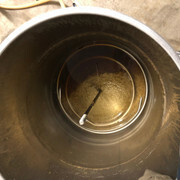 I had a minor problem with trub draining out (via pickup tube) with the final litre of wort into fermenter. Solved this by merely increasing the total final wort volume by a litre. Packing up under the outlet like you have when whirlpooling would have been another solution but never occurred to me at the time. 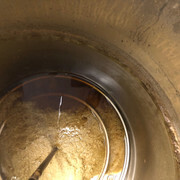 Any trub/wort left in the kettle is poured into a container & left overnight in fridge to settle with the resulting clear wort then being frozen for use in the next starter. I don't use a hopsock as I feel as though since I discontinued using them a couple of years ago I've had better aroma in my beers from late hop additions. I also got a bit sick of cleaning the socks, and being short on time, any time I can save on cleaning is great. I've read one of your posts a while ago about letting the trub settle and using the resulting wort for starters - which I think is a great idea. I'll implement this into my process when I resume using liquid yeasts. Again, I've been using mostly dried yeasts lately to save time! Although the reliability of some of the brulosophy testing is a bit subjective - he had the loose vs bagged kettle hops samples lab analysed. 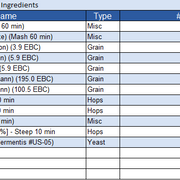 IBU was 8% lower on the bagged version - I wonder if this would have a more profound affect on aroma? Thanks for the link Engi. 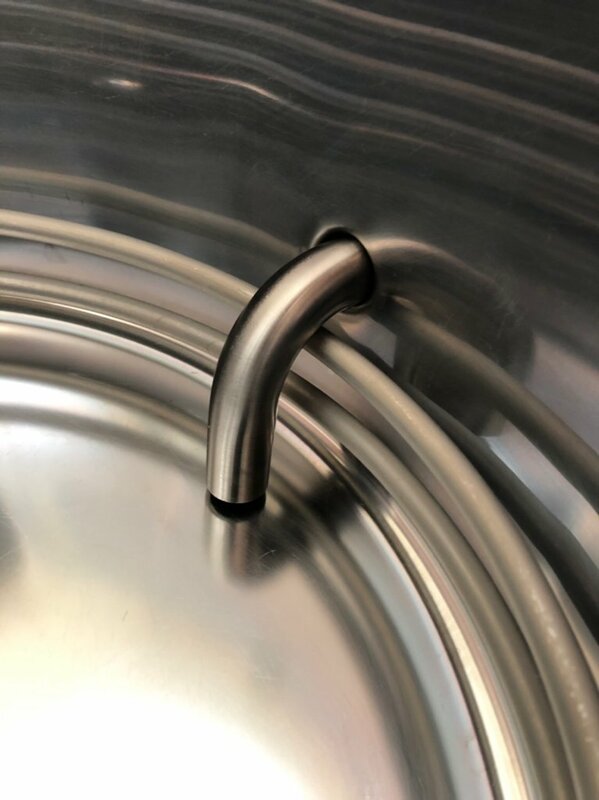 I was told by one of our sponsors many moons ago that you lose around 15% of your IBU when using a hopsock & so have always added that extra percentage when forming my recipes. Can't say I've ever been disappointed since doing this but that's just me. 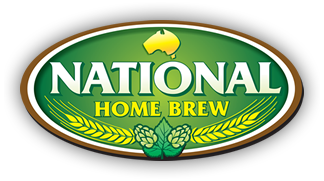 Hey Pete, did some quick calcs, re: the extra 15% hops - on a mildly hopped batch I would have to yield 2 litres extra to offset the cost of the extra hops. What wort do you estimate you yield extra by using a sock? You’re dazzling me with science Engi . 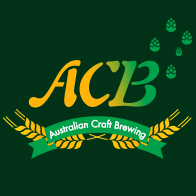 Sorry for the late response but busy brewing up a California Common ATM. Been doing this for so long it’s become second nature. I add the extra hops when weighing out. 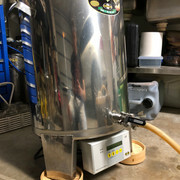 FV’s are calculated to end up with a keg + 3 bottles for lightly-hopped beers & when doing an IPA for example, I usually finish up with a keg + 1 bottle more or less depending on hop amounts. Everything works out fine 99% of the time. One of the first things I did when getting BeerSmith was to delete the pricing on every single item in the prog. Don’t bother with the inventory either. Too much farfing around keeping them up to date. Just jot down a note if running short of anything. Pickup isn’t too hard, bought a 3/4” SS tube weld elbow from Prochem and had a friend large two grooves into it. 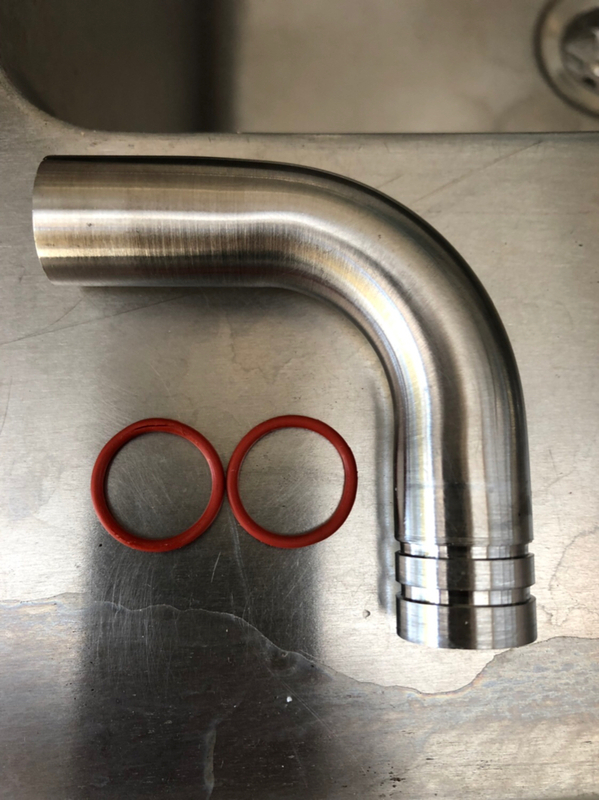 20x1.5mm silicone orings are the perfect fit. Thanks DJ. Looks really good. Do you have a link for where you got this elbow? Here is the catalogue the part is on page 74 part number TEL090D019.1AP www.prochem.com.au/wp-content/uploads/2013/09/Prochem-Piping-Products-2-Hygienic.pdf you could go for the 304SS version might be a few dollars cheaper but from memory this part was $8. Orings I got off eBay.